Well, actually, in Japan they don’t call it that. In Japanese sake is quite a generic term, meaning something like ‘booze’. This I found out after sparing no time or effort trying to explain to the non-English-speaking Japanese waitress that I wanted to have some sake. She just pointed at the drinks menu, throwing me a perplexed smile, implying, ‘Look, silly, these are all sakes.’ So, before we even begin, I must teach you the Japanese word for sake: NIHONSHU. Very long cordons on high-trained trunks – what an unusual sight! 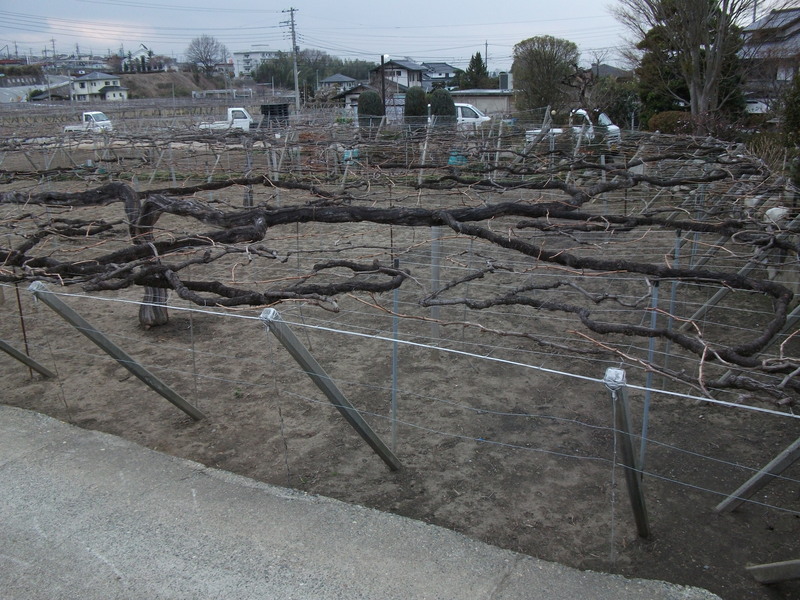 While in Japan, I tasted a number of different alcoholic beverages, including shochu, a spirit that can be made from grains or fruits, and wine made from the Koshu grape when we visited the Kurambon winery near Mount Fuji. That was also quite interesting, especially to see how they train their vines (I think in an attempt to protect them from humidity and fungus infections). But the wines are made in essentially the same way. Sake, on the other hand, is a different story altogether. It’s more like making beer (from the limited knowledge of beer-making that I have). 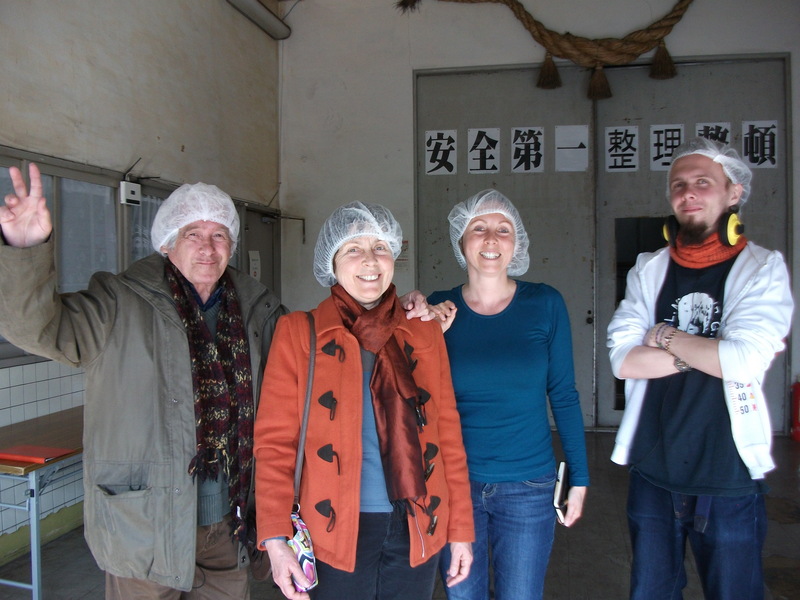 I and my family paid a visit to the Shin-Se brewery outside Kyoto. They weren’t quite used to welcoming tourists, apparently, but the fact that we had come all the way from Europe, and that I wanted to write up the story, seemed to help. The brewery was a surprisingly old-fashioned plant, and most of its equipment couldn’t be described as high-tech by any stretch of the imagination. This is actually a general observation I have made about Japan. We associate it with the latest cutting-edge technology, which may be true in some sense, but in people’s lives this is not reflected at all. The cars they drive, the trains and buses, the buildings typically give the impression of worn-out objects from a different era. Let’s start at the beginning. What we call sake is made from rice, and rice alone. But sake is a complicated matter, because how you clean the rice will produce several different types. So producers polish their grains to different levels of purity, to get closer to the starchy middle (for more expensive sake) or to include the rest as well (for cheaper products). The result is plain GINJO for less pure sake and DAIGINJO for a drink of purer starch content. In Shine-Se ten different kinds of sake rice are used. These are fermented separately and produce separate brands or styles. In a high-quality sake, I was told, you won’t have more than two kinds of rice blended (but in commercial drinks anything goes). After washing and polishing, the rice is steamed for about 40 minutes. The water quality is considered very important, just like with beer, and producers tend to have their own source of water. The damp rice is then laid out thinly, in a single layer, on large flat trays and dried so that only the middle remains damp. The rice then undergoes a careful selection process and is then moved to a large flat basin, where it is allowed to pre-ferment for three days. This pre-fermentation serves to hydrolise the starches in the grain – that is, to convert the starches into sugar, which can then be fermented in the next stage. Our brewery uses cultivated yeasts to start the ferment, and temperatures can reach 33-37 C in the process. Temperature control is carried out manually as it is a very nuanced operation, our guide explained. The rice is under constant 24-hour surveillance at this stage to make sure temperatures don’t rise above 45-47 degrees. When this hydrolisation process is over, the real ferment begins in large stainless steel tanks. 4 parts steamed rice are normally mixed with 1 part malted rice and water is added to create the mash. The tank is called SHUBO, meaning ‘mother of the sake’. The ferment, in various tanks, takes up to a month or so, at low temperatures. When the fermentation is over, the brew is filtered – or not, in which case we get NIGORI, unfiltered sake white as milk. 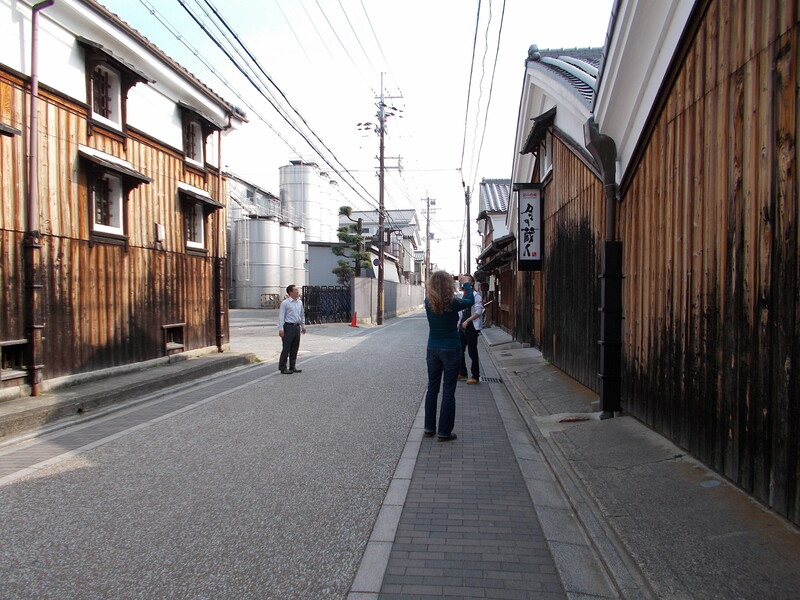 The sake is then left to rest in tanks (or less commonly in wooden casks) for several months. But some sakes, I was told, are allowed to mature for up to 30 years. 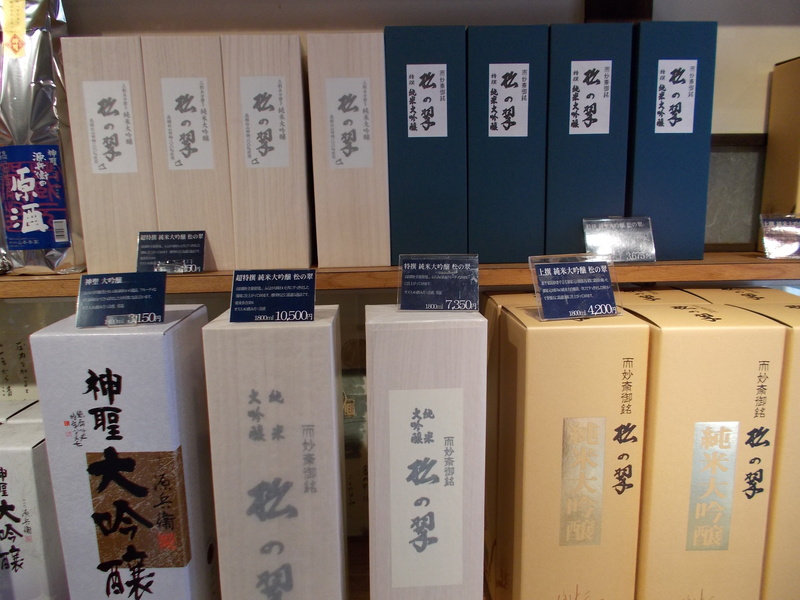 Standard sake has an alcoholic strength of 15-16% but some reach 21-22%. Just like with most spirits and beers, what matters with sake is not the ‘vintage’ but a consistent house style. This is achieved through choice of grain and careful management of the fermentation process. 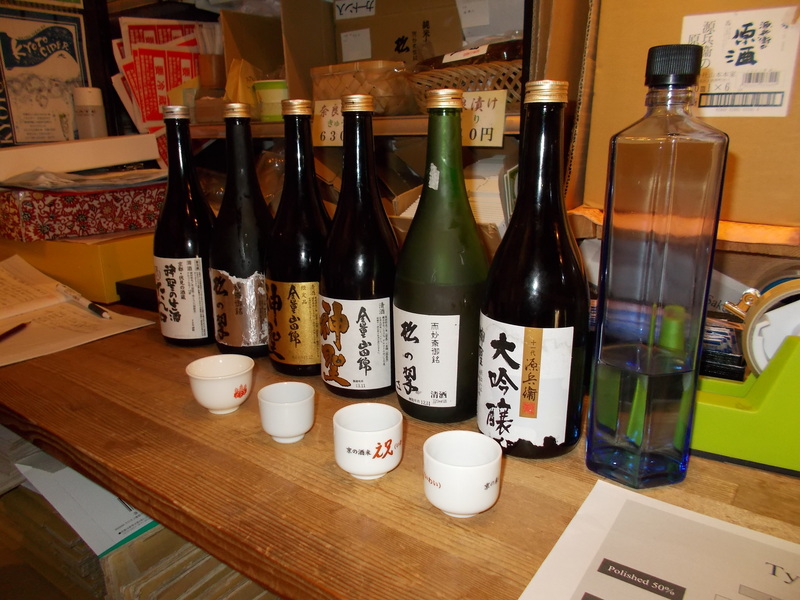 At Shin-Se we tasted a variety of sakes from cheaper and simpler to more complex and refined. Some were fruitier, others had pungent vegetable flavours and aromas. My favourite was a JUNMAI DAIGINJO, which means that it’s an all-rice sake, that is, no alcohol was added separately, and the rice was polished down to 50% (as opposed to 70% in a less pure plain sake, or 60% in a Ginjo). One of the difficulties is, though, that all the labels only had Japanese script so it’s very hard to identify in hindsight what the full range was! the flight of sakes we tasted, going from right to left. Don’t ask me what the labels say!